I have no idea why she said that because she told my dad within the week. My dad was so concerned about it, he decided we needed to have a heart to heart conversation about this crazy idea. It was almost like I had announced I was getting into crystal meth. It wasn’t that my parents were atheists. It wasn’t that they were even anti-religion or anti-church. They were and up to that point always had been good church people. It was precisely because they were good church people that they knew what “good church people” do to good church pastors. They eat them for dinner. The problem at that point was that I couldn’t picture myself doing anything else. This calling was in my heart and blood and bones and no discouraging words from those who had lived decades in the trenches could simmer my passion. I think that was probably the point. First person to save and sanctify the Sasquatch gets a free swimming pool in their mansion of glory! But along with those apocalyptic warnings came good advice. Pray more. Sleep more. Have good mentors. Take your day off. Take your vacation. Exercise. And of course academia is not the only village to see the Burnout. Everybody else has seen it too. Most major Christian magazines and blogs run “Clergy Burnout” articles constantly. Some of are written for the clergy, some for the laity and they all recycle the same old advice. Be easy on your poor pastor. Support your poor pastor. Give them more stuff. Let their children get away with more stuff. And BY NO MEANS call them on their day off. All that is good and helpful. We are just human, but some of those articles tow the very fine line of treating pastors like we are the poor handicapped kid in the second grade who needs “special treatment.” And I don’t think that is the case for the handicapped kid or for your pastor. The handicapped kid doesn’t need “special treatment” or attention. They need what you need, to feel like they are a valuable part of the group and a healthy, loving community. Your pastor needs that too. On that note, a couple months ago I read a now old book called “Failure of Nerve” by Edwin Friedman. I meant to write a review here but never got around to it. 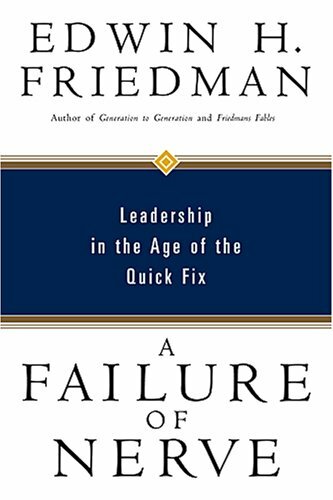 Friedman wrote the book on his death bed and it was a compilation of several years worth of research and lectures. It was his magnum opus and unfortunately he died before finishing it. Friedman worked among national leaders in Washington D.C. for 40 years. He was a Jewish Rabbi and marriage counselor, as well as an adviser to several Presidents, congressmen and women and other politicians. He eventually came to disbelieve several myths about how leadership works and he spent his life trying to dispel them. “Failure of Nerve” was his last great shot and it worked to some extent because 20 years after he died, here I am revisiting all my assumptions about leadership because of him. One of those “myths” that he vehemently expels is that stress comes from working too hard. After working with several teams of people, particularly in politics, who worked 16 hour days for months at a time and never burned out, he knew that not to be the case. Instead he found that stress comes from bad relationships. He argued that if you are part of a good team and doing work you believe in, 16 hour days are your joy, not your angst. But if you are working 5 hours a day with a dysfunctional team, the Burnout monster just might rear its ugly head. So follow with me here and consider that clergy burnout might have nothing to do with long hours and little pay. It might have nothing to do with difficult and hard work. That should be our joy. Instead, if Friedman is correct, it might have everything to do with dysfunctional teams. If I am right about this it means that the best way to support your pastor has nothing to do with supporting your pastor. It has everything to do with supporting the person sitting in the pew next to you. It has everything to do with creating a climate in your church of love and respect, a respect that doesn’t start or stop with your pastor but finds it end goal in the least of the church members among you. And probably for your pastor too.